Think of electric car ownership and you might first of all consider the clever tech that powers EVs before turning your mind to the ‘range anxiety’ we’ve all read so much about. 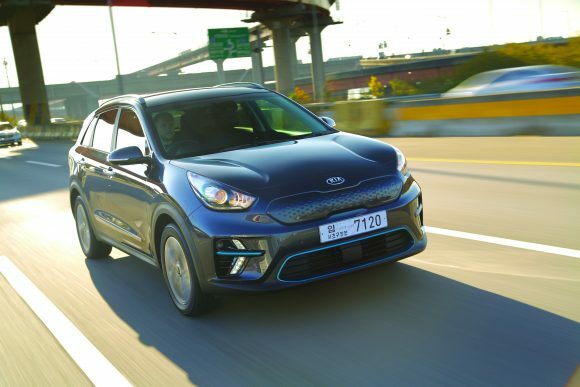 That’s about to change, thanks to the South Korean pairing of Kia and Hyundai, both of whom have been busy developing models that offer 300-odd miles of emission-free electric motoring. The e-Niro, a compact crossover, is Kia’s offering. The e-Niro is equipped with a high-capacity 64kWh lithium-ion polymer battery pack. While it can deliver a driving range of 282 miles on the combined cycle, on the urban cycle that figure rises to a hefty 382 miles. The battery pack is paired with a 201bhp (150kW) motor, producing 395Nm of torque. Like the Niro Hybrid and Plug-in Hybrid variants, the new EV is front-wheel drive. Regenerative braking technology allows the e-Niro to harvest kinetic energy and recharge the battery pack while coasting or braking, while the Eco Driving Assist System (Eco DAS) provides the driver with guidance on how to drive more efficiently. Driving the e-Niro is a pleasure. Our test route took us on rural backroads, modern highways plus everything in between and the car handled it all with poise and precision. Overtaking is straightforward, thanks to the instantaneous delivery of bags of torque when you put your foot down, while visibility is good. What helps the e-Niro feel particularly sure-footed is its low centre of gravity – and that’s largely because of its chunky battery pack. At the front, its closed ‘tiger-nose’ grille design features an integrated charging port, while redesigned air intakes and new arrowhead-shaped LED daytime running lights combine with blue trim highlights to help the car stand out. At the back, a redesigned rear bumper features similar blue trim highlights. The car is available in five paint colours, including Pluto Brown – a shade unique to the e-Niro. The design of the centre console is one of the most interesting features, with the all-electric powertrain not requiring a traditional gear lever and gear linkage. The physical transmission has been replaced with a rotating drive selector, while the dashboard features bright blue trim around the air vents, echoing the trim found on the outside. The 8.0-inch touchscreen HMI (human-machine interface) in the centre of the dashboard offers a series of features specific to Kia’s new electric vehicle. Most importantly, it enables owners to locate nearby charging points and monitor the level of remaining charge and range. Kia is keeping things simple when it comes to marketing the e-Niro in the UK. Only one variant of the car will be arriving on these shores – a ‘First Edition’ model that it hopes will satisfy everyone. The exterior design features halogen headlights with Bi-Function projection, front fog lights, LED daytime running lights and LED rear combination clusters. Privacy glass for the rear windows and tailgate deliver an upmarket appearance. Convenience features include rear parking sensors and a reversing camera system, electric windows all round, an auto-dimming rear-view mirror and an engine start/stop button plus a Smart Entry System. We think the e-Niro will be a big hit for Kia – it’s stylish, feels poised yet powerful, and delivers a winning combination of crossover capabilities with emission-free motoring.